Abdul Ahad, Department of Mathematics and Statistics, Bedfordshire University, Luton, England, UK. This is a sum of reciprocal squares all the way to infinity that is dealt with in a new alternating fashion of adding and subtracting consecutive terms in the ratio 2:1 respectively. Convergence, Irrational, Reciprocal squares, Infinity. Where the use of the inverted brackets) (denotes “Add together two consecutive terms of this series then minus the next term and repeat this in an alternating fashion”. 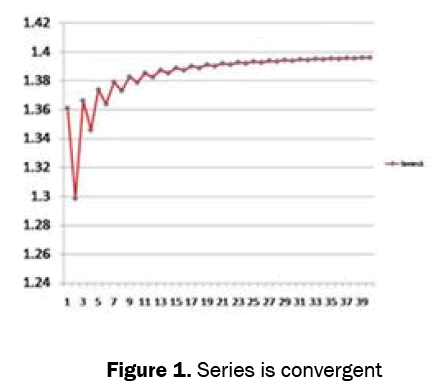 By calculating the first 40 consecutive terms and plotting their cumulative sums on a graph it is clear that the series is convergent and that the limit exists (Figure 1). We note an apparently fast rate of convergence and that the sum appears to be tending to a limiting value of around ≈1.4. Convergence can also be proved analytically by using an appropriate test. The comparison test in particular is used in this paper as follows. The first term in (2) is a constant, so all we need to prove is that the sum in the second term converges. This can be compared with the similar p-series for the special case of p=2 (Riemann Zeta 2). Since converges absolutely, so the new series invented in this paper also converges absolutely. Inputting the series into Wolfram Alpha  the sum value at infinity is computed to be approximately 1.4014680389755... This limiting value was found by calculating up to 10 million terms. This in fact is an irrational number that can be proved to be irrational by a comparison test to sums of other very similar series. Because x is intrinsically of a similar construct to the above series and their sums converge to irrational numbers, it follows that the overall sum of the new series in (2) is equally irrational. Ahad A.Proofs of my new infinite alternating series. Google Groups. sci.math.2017. Eremenko A.How Euler found the sum of reciprocal squares.2013.